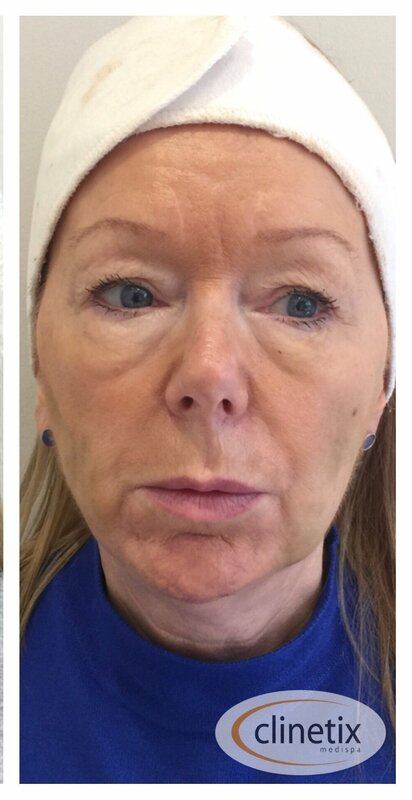 Often called a “non-surgical facelift” a thread lift is a minimally invasive treatment for lifting loose and sagging skin of the face without a general anaesthetic. It is performed using local anaesthetic and takes about one hour. After the treatment patients are able to return home. As we age, changes in the collagen and elastic of our skin, combined with loss of fat and support leads to the hollowing and sagging of the skin creating a tired and aged appearance. A Clinetix Thread lift uses sutures placed under the skin to lift and reposition the loose skin. The sutures used are bio absorbable, which means that your body will gradually break them down and they do not need to be removed. The sutures not only lift reposition the tissues of the face but they also stimulate collagen production in the skin to improve the skin quality and produce a long lasting result. The Clinetix Thread Lifts are performed in Glasgow and Bothwell by our Medical Team led by Dr’s Simon and Emma Ravichandran. Our team will assess you for your own individual thread lift treatment to ensure you get the best possible result. The Clinetix Thread Lift involves the placement of thin PDO threads under the skin of the face and neck. The threads are designed both to mechanically lift the position of the skin and to stimulate collagen formation in the skin. The outcome is a natural looking refreshed appearance to the face and skin and the results can be very long lasting. If you are interested in a thread lift treatment we recommend a no obligation consultation with either Dr Simon or Dr Emma Ravichandran to discuss the potential benefits of the treatment, as well as any potential complications and steps that we can take to maximise the outcome. As with all medical treatments at Clinetix you are encouraged to take time to consider the options before committing to a treatment. If you would like to proceed with treatment this will be scheduled for a different day. We perform thread lift treatments using a combination of numbing creams and injections for anaesthetic. The treatment takes less than an hour and you are able to go home almost immediately afterwards. We will provide you with a support dressing that you can wear in the house and in bed for the week following treatment that will help reduce swelling and bruising. We may also prescribe antibiotics to take as part of your treatment plan. Clinetix also offer post treatment phototherapy sessions to help the recovery and improve the outcome. If you would like to know a little more about the Clinetix Thread lift you can have a look at our Blog article here or get in contact to arrange a consultation. At Clinetix Rejuvenation we use different types of threads for certain results. We use threads in the upper face to lift and re-position loose and sagging skin. Whereas threads in the lower parts of the face are used to stimulated controlled collagen synthesis to lift and tighten specific areas. The treatments can also be used in the neck to pull up loose skin and reduce excess fat under the chin. We are getting amazing results with our Clinetix thread lifts and combination volume replacement treatments with thread lifts. We now also have been using our U225 meso needling device to painlessly integrate mesotherapy or PRP at the same time as threading. This is to improve skin condition as well as improve the collagen stimulation effect of the threads leading to a better and longer lasting result! Am I suitable for the Clinetix Thread Lift? The treatment is designed to address loose sagging skin of the face, jawline and neck. Most people are suitable for treatment but as with all medical treatments an assessment is needed with the doctor to assess your suitability. How is the Clinetix Thread Lift performed? The Clinetix Thread Lift is performed in the clinic under local anaesthetic. A few areas of the face are numbed with small injections and the threads are inserted through small punctures made in the skin with a needle. All of the threads remain underneath the skin after the treatment and the needle entry points close over very quickly. The position and number of threads will vary between individuals, depending on the anatomy and desired outcome. Is the Clinetix Thread Lift painful? There is very little discomfort during the procedure due to the local anaesthetic used. People tend to describe the discomfort as a 2 out of 10, less than getting eyebrow hair plucked! There is often a little bruising after the treatment, typically it is small enough to cover with makeup but it may take a couple of weeks to resolve. 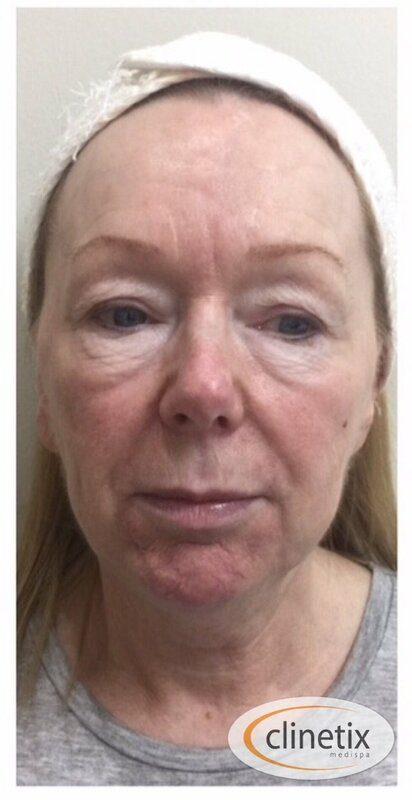 The Clinetix Thread Lift costs £1800 for the face and £2500 for the face and neck.